On July 3rd, French President Emmanuel Macron arrived in Nigeria for an official visit. On July 3rd, the Newrest ASL teams provided the services on board Emmanuel Macron’s presidential jet. The delegation first landed at Abuja’s Nnamdi Azikiwe International Airport in the afternoon before arriving in the evening at Murtala Muhammed International Airport in Lagos. After visiting African Shrine of the late Afrobeat musician, Fela Anikulapo-Kuti, the President visited Ikoyi on July 4th to inaugurate the headquarters of the Alliance Française, a center for culture and the French language. Thanks to their know-how, the Newrest ASL teams have adapted to the specifications and instructions for this presidential trip to Africa from the first port of call. 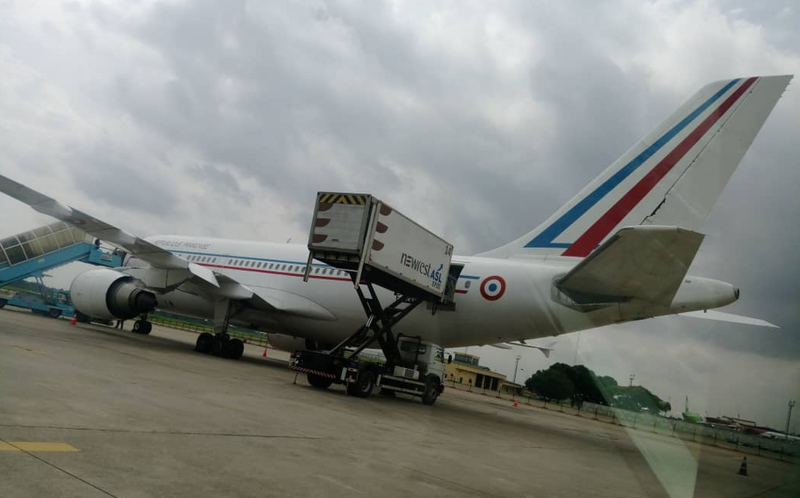 Among the services provided, unloading, washing equipment and storage, thanks to high-end loaders used on the right sides of the aircraft to meet the needs of the French elite. Newrest ASL CEO, Key Account Manager, Operations Manager and Restaurant Supervisors ensured that the situation management provided on-time delivery, excellent taste and impeccable presentation. The crew and the passengers left conquered and thanked the local teams for the quality of the services.